Has anyone ever told you that you can’t do something? That you can’t be something? That you shouldn’t chase your dreams or reach for the moon or glide amongst the stars? Well, don’t listen to them. As the saying goes, you can do anything if you set your mind to it. Okay, sure. All of the brain power in the world can’t grant us the ability to fly or the strength to move mountains. But there is a lot of truth to that statement. Yes, the world really does lie at your fingertips and dreams are reachable, no matter how unreachable they may seem. What do you want to be when you grow up? Do you remember being asked that as a child? Recently, I directed that same question to a client’s three year old son during an office meeting. He responded with contagious enthusiasm, “A DOG!” Ah, to be young again … Sure, this response is an extreme example of what we perceive to be possibilities as children. But perhaps you answered that question with more realistic aspirations; a scientist or astronaut or President of the United States, even. The point is, as children, we really believed that we could be anyone and do anything. Without a smidgen of a doubt, the whole world was within our reach. So at what point did that all change? Maybe it is because, along the way, our beliefs (in what we can do and what we can be) are molded by our surroundings. We grow to learn that whether it be our individual circumstances, the presence or lack of luck, or the extent of our talents, our dreams and aspirations are limited. Not everyone can win the gold medal in ski jumping at the Sochi Winter Olympics. Not everyone can become a rocket scientist by mastering the study of aerospace engineering. No. Those dreams, those accomplishments, those aspirations are limited to those who are born with talent, who are born with smarts, who are born with wealth. They are not for people like me. 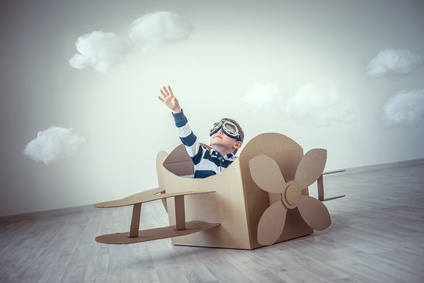 At least, that’s what we learn to tell ourselves and, along the way, we lose sight of our personal beliefs; the belief in ourselves and our dreams that we saw as children as we sat in cardboard airplanes with oversized goggles on, reaching for the sky. Okay, sure. We can’t set unrealistic expectations. As much as we set our minds to it, an innumerable amount of “Cannots” exist. We cannot move mountains, or fly, or transform ourselves into tail-wagging canines – we are humans and we have limitations. Despite the long list of Cannots, however, what remains is a boatload of “Possibly Cans” – Possibly can become a scientist, or astronaut, or travel the world, get a college degree, snag that interview, etcetera. Interestingly, the word “dream” oftentimes implies a negative connotation and suggests an [unrealistic or self-deluding fantasy,] as the dictionary defines. But just because something is considered a dream, shouldn’t automatically mean that it is unrealistic and unreasonable. Maybe, just maybe, what we perceive to be idealistic aspirations are not as impossible as they appear. The word “dream” doesn’t just connote the impossible. It connotes the possible. It suggests that the ability to envision a dream points to its potential achievability, an “if you can dream it, you can achieve it” kind of message. What we fail to remember is that, sure, we are humans with limitations, but we are also humans with an immense capacity of intelligence and power. Of course, we shouldn’t expend energy in aspiring to accomplish the universal Cannots. But the Possibly Cans? With the right formula of realism and positive thinking, of determination and motivation, we can be whatever we want to be and do whatever we want to do. With the right formula our dreams … our aspirations … are limitless. So, next time someone tell you that you can’t do something or that you can’t be something, don’t listen to them. Listen to yourself. Eliminate the word “impossible” from your vocabulary and divide that negative expression into two independently powerful statements: I’M POSSIBLE. I am possible. You are possible. We are all possible. Everything is possible – if you set your mind to it. Twenty five years ago, I left for one of the best years of my life – my year as a Rotary exchange student to Australia. Nineteen years ago, I went back for a visit. In three days, I’m leaving for another two week visit. Thanks! It’s a beautiful country, full of nice people. But isn’t that true if so many places? I’ll be blogging about it every day for two weeks starting Saturday if you want to follow along! Eliminating that word “impossible” is so important. It certainly is! Thank YOU for reading! That’s exactly right, Jade! Thank you for stopping by! Thank you for sharing and for the kind words, Mandi! It means a lot! Thank you for sharing such inspirational thoughts! I’m so glad that you enjoyed it! Thank you for reading! I couldn’t agree more.. Eliminate ‘impossible’ from your vocabulary and eliminate negative energy from your environment. If we take complete control of our own lives I too believe we can achieve just about anything we desire! Thank you for sharing this. I love Disney quotes. They fit for everyone and are based on his own personal experience. Encouraging thoughts. Thanks visit my blog.